It’s time to admit it, fall is here and it’s here to stay. And whether you’re rejoicing in the pumpkin patches or preparing for six months of hibernation, the cold weather means cold season. Not to worry though, we’ve got you covered! Here are a few of our favourite goodies to help you get ahead of those sneaky colds and boost your immune system. This bad boy is packed with immune-boosting vitamin A and C (the more orange a food the more vitamin A, so pack in those carrots this season!) as well as anti-inflammatory superpower turmeric. Not only is turmeric an antioxidant powerhouse, it’s also known as being soothing for the digestive system (a key player in immune health) and it actually helps foods retain the amount of vitamin A they contain once they’ve been picked and processed. What could taste more like fall than fresh apple cider? We kick ours up a notch by adding ginger and lemon. Fresh lemon juice is packed with vitamin C and also contains natural antibiotic properties, so it’s perfect for nipping that cold in the bud! Ginger has the amazing physiological effect of making our bodies sweat. This warming effect is super detoxifying and stimulating for the immune system! Need a little extra warming? Try it hot in our Hot Apple Cider! This super potent shot of pure immune-supporting goodness is just what you need when you feel those sniffles coming on! Fun fact, pepper actually helps to activate the active ingredient in turmeric, called curcumin, as well as encouraging that natural warming effect in the body! Not sure you can handle the intensity of an elixir? Try it hot in our Golden Milk Latte. When sweater weather arrives, this immune boosting bowl is the perfect addition for your next moment of cozy comfort. Heat oil on medium-high heat. Add onions and saute until translucent. Add garlic and ginger and half of the salt, turn down, and cook until lightly browned. Add spices and stir. Add crushed tomatoes. Add coconut milk and carrots, stir well. Rinse lentils well and add them to the pot. Add water to the pot and stir well. Let simmer on med-high heat for about 30 minutes, stirring regularly to prevent the dahl from sticking on the bottom of the pot. Turn down to medium-low and continue cooking until the lentils are soft. Once cooked, the consistency should be thick but more on the liquid side. If it is too thick then thin with water. Add tamari, cilantro and scallions and stir well. The Shine Driver is a simple, yet tasteful Pure Kitchen twist on the classic Screwdriver. This drink combines Top Shelf Vodka with Pure Kitchen’s cold-pressed organic Shine juice. Top Shelf is a distillery based out of Perth Ontario, providing a local product at a reasonable price. All of Pure Kitchen’s juices use organic produce, creating a fresh and nutritious flavour in every sip. The Shine juice is comprised of orange, grapefruit, ginger, and turmeric juice. This cocktail is easy to make at home, as all Pure Kitchen juices are available to go in sixteen ounce bottles. What do avocados, brown bag lunches and youth hunger have in common? Read on to find out how we spent a Friday morning making food for youth in need last week in partnership with Mealshare. We get asked about a little symbol on our menu often, followed with the question, “What is Mealshare?” when patrons are carefully selecting their lunch or dinner. You may have seen this symbol by our Warrior bowl (grilled avocado, quinoa, dynamite sauce, lemon tahini sauce, steamed goddess greens, spiralized zucchini, broccoli, your choice of kimchi or sauerkraut). That’s because we teamed up with Mealshare so that every Warrior bowl sold gives a meal to a youth in need in the city. You buy one, you give one! One of the Ottawa Mealshare partners is Operation Come Home - Ottawa’s only youth drop-in centre open mornings with a huge roster of youth support services for those aged 16 – 25 in need of health, housing, or employment aid in the city. 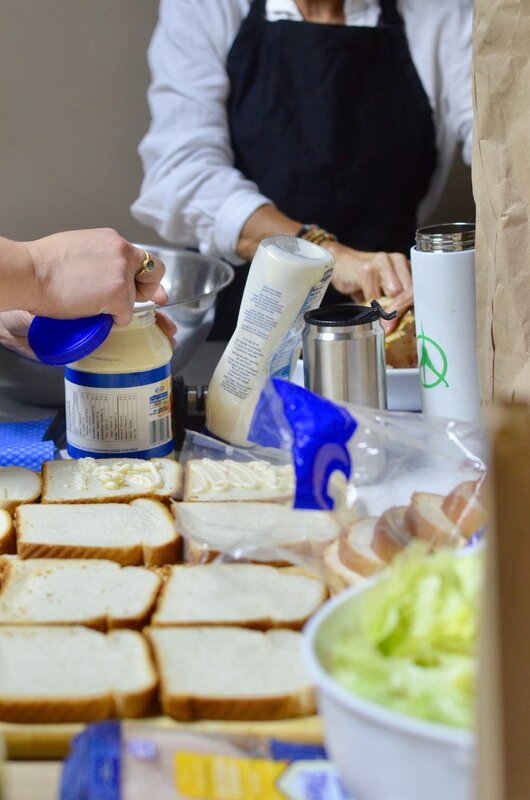 We had the pleasure of bringing a few staff in to volunteer their time making a hot breakfast and brown bag lunch one Friday morning for the youth in their drop-in centre that day. 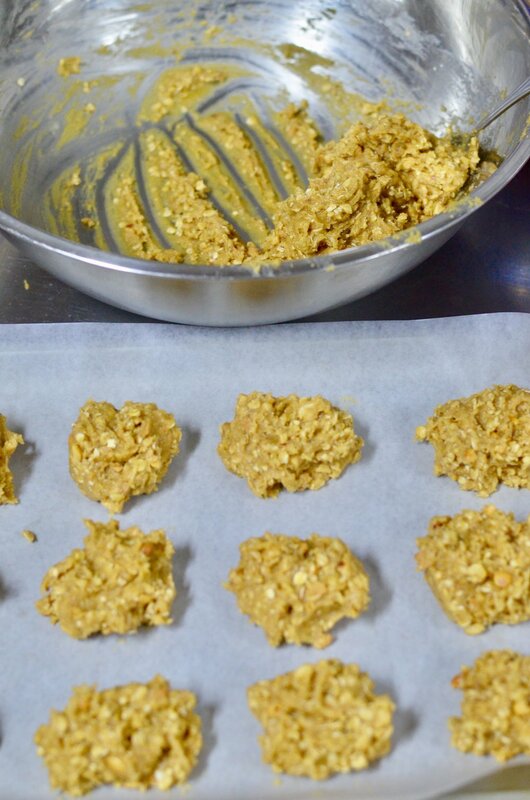 Together, we were able to prepare 20 brown bag lunches filled with fruit & veg, a sandwich made with whole & real ingredients, and because of a surplus of peanut butter in the kitchen - some last minute cookies too! Here are a collection of images from our time in the kitchen. Next month we will be dropping into Parkdale Food Centre!